Another good pick for dinner during our stay at Launceston. And again close to the Cataract Gorge Reserve – hence the name “Cataract on Paterson”. We walked in and saw a large dining area. An interior of early settler mixed with an outback Australian barn feel. Their website looks pretty sophisticated but it errs on the side of casual dining. So don’t feel overwhelmed! Plenty of dishes to choose from their menu. We ordered half a dozen of Kilpatrick oysters, $24 for starters and they were very good. Strong worcestershire sauce, and it was definitely “their killer” – it was the star. Oysters were fresh. Presentation was pretty. Pan seared Scallops with bacon lardons in rich garlic cream sauce on a toasted brioche, $19. It was an entree dish but enough for us to share together having ordered the stone grill. Although small in size, the scallops were tender. The brioche helped us swipe every bit of the creamy sauce from the plate. The sauce was nice with the scallop. A little salty for my liking but J found it was fine! 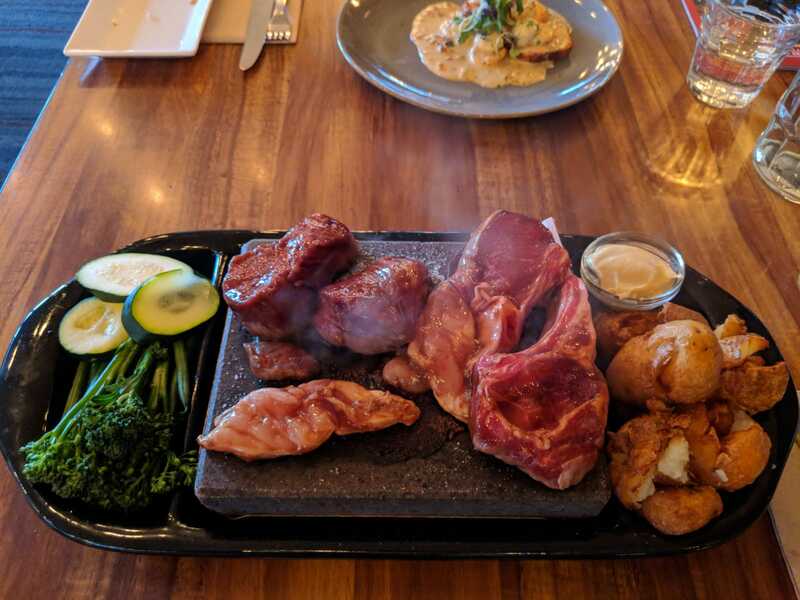 Our friend recommended their stone grill – so we ordered it. The waiters also explained to us before we ordered that their stone grill is on 100 degrees perfect for when it’s brought out to us. We cook the meat ourselves to our liking. We ordered their Paddock to Stone, $40: a selection of marinated cuts of 110g of Tasmanian eye fillet, 2 x Tasmanian lamb cutlets & a free range chicken tenderloin. All of the meat were tender. Marinade flavour was perfect on the chicken, but not on the eye fillet. Suggest adding salt and pepper for some seasoning on the fillet. But it was a beautiful cut. The lamb cutlet was good too. We picked the mustard sauce. Good but would have pick a different sauce knowing that it wasn’t part of drizzling onto the meat. The grill was served with seasonal greens and mashed roasted chats. We could choose from salad, roast veggies or seasoned chips. But we’re glad we chose veggies, because they were delicious! I’m not usually a fan of broccolini and beans, but this was blanched before it came out, having it grilled on the stone made it really nice. Not to forget the roasted chats were AMAZING! Crispy coated like chips and very soft on the inside. The pieces were in bite sizes – easy for us to eat. I’d eat this over chips! Overall, another restaurant of recommendation. Suggest trying their stone grill! Caters for large groups and if you want some privacy, they have erected some walls just so you don’t feel squished next to other diners.